Summer was the season the children of Alcalá looked forward to most. This was not because the schools were closed, nor because we could sleep in, nor because we could play endlessly; quite the opposite. It was because we could get up earlier, because we felt more free and because we could run all round the nooks and crannies of the Barrio Alto [top part of the town] and the countryside around Alcalá. Nothing escaped us, we heard all the news good and bad. Everyone was busy with the harvest and we could do whatever we fancied, from 21 June until the autumn, the Indian summer or Michaelmas, when we went back to school again. On 24 June, the Fiesta de San Juan, they used to make a big bonfire in the top square and many people would turn up to watch the young men jumping over the flames. The children went too, and sat in the front row, but we weren't allowed to take part because it was too dangerous. Some young men used a pole to vault high in the air, but others did it unaided and landed on the edge of the fire. I never found out the origin or significance of this tradition, but I remember vividly the astonishing dexterity displayed by the young men. I still retain the memories of those sun-flooded summers, of freedom and of the water in the pools of the River Barbate. And of those nocturnal fires in the Alcalá fields, crawling like snakes across the stubble. Most of them occurred in June, July and August. It was natural, because in those days existed the bad practice of burning the stubble to prepare the fields before the first rains. The main places for fires were the stubble-fields, the pastures and the woodland. From the Alameda the stubble-fields in flames offered a Dantesque spectacle, with formidable bonfires competing to burn the straw left over from the harvest. The worst thing that could happen was the arrival of the Levante [east wind]. Then the flames spread beyond their limits and nobody could control them. The Council put notices in the bars asking people to take the greatest care, but rarely a year passed when there was no complaint about uncontrolled fires. There were also fires in the pastures. Their origins were more difficult to detect, because they could be caused in many ways. It could be an electrical spark from a summer storm, or bottles abandoned in full sun, or the revenge of some arsonist because he couldn't go and gather wild asparagus or snails, ending up with a terrible fire. And it was made worse when the resin of the tree branches in the pastures caught light, fuelling the flames. 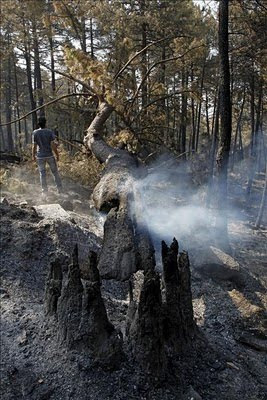 The biggest disasters came when a fire started in the woods of the Alcornocales. It was a genuine inferno, against which it was very difficult to fight. In those days we didn't have the necessary equipment to overcome a forest fire. The consequences were terrible for plantations which had taken many years to maintain and convert into splendid groves of trees. And above all, what suffered most was the ecosystem, where the richest fauna lived with the support and protection of the very special flora. The fire reduced it all to ashes, ruining both the animal and the plant life. Fortunately, public administration these days has created the forest firefighters, organised in teams of reserves and equipped with the most advanced tools to overcome the conflagrations. On the way into Alcalá, in the place called “Conservación del Parque de los Alcornocales”, the reserves are posted ready to go out immediately a fire is detected; helicopters, heavy machinery and fire engines are always ready to go and put out the fire in record time. More than 2,400 km of drovers' trails and other tracks facilitate their arrival at any point in the seventeen municipalities of the Natural Park.